• What are The Red Skull’s new powers? How did he become the most powerful man on Earth? • Can Havok and Thor defeat the spreading influence of Honest John, The Living Propaganda?! • Rogue and Scarlet Witch trapped on the Isle of the Red Skull’s S-Men! • Wolverine & Captain America: uncover the truth behind the worldwide mutant assassination epidemic! I like Rick Remenders work but it's some weird stuff going on in his mind. I read it but don't remember anything earth shattering. Basic setup issue. What was the spoiler? Not really Earth shattering as much as a total disregard for character. Or in this case characters equipment. Heard that Cap asked ... someone (I forgot ... Havok?) to fire a shot at his shield to propel him into the air. Sort of like the Colossus/ Wolverine toss. Problem is ... and any writer should know this and any editor should damn well stop it ... the problem is that his shield works in the exact opposite way. It is made of Vibranium. It absorbs inertia and kinetic energy. How many times has that shield been blasted and Cap moves not or in most cases send the blast back? Hell, they even show it in the Avengers movie when Cap stops Thor's hammer. CAP STOPS THOR'S HAMMER. Now, suddenly, due to writers desire, Cap can use his shield as a launching device? This isn't Flash or Invisible Woman finding a new way to use their powers, this is a total disregard to a predetermined law of action. Look, I know this entire rant is about as base comic nerd as you can get, and someone could easily read it aloud in a Steve Urkel voice but that doesn't change the fact that this is one of the problems I have with current writers. They take a story they want to tell and mold and reshape the characters around it, instead of the other way around. Of course, if this didn't happen, and I heard wrong, I shall, in MY best Urkel voice say "Did I do that? Nevermind"
EDIT - Now don't get me wrong, Cap has been knocked around before using that shield, but getting blown back a few feet from impact from a high-output power slam, is not the same as being propelled into the air by a mere plasma blast. Again, he stood tall against Mjornir without being rocketed back 500 feet. And once again I made this post even more nerdy. Meh. That's how I felt. Nothing really drew me in. Check Out My Comic Trade List, Click Here! Trade Video Games with Me, CLICK HERE! Heard that Cap asked ... someone (I forgot ... Havok?) to fire a shot at his shield to propel him into the air. Ok - we're over a year into this and the recent previews peeked my interest. Seems like I remember folks saying they like it. What's the skinny? Any good now? I bailed after the Red Skull arc. 'AVENGE THE EARTH' Part One Welcome to Planet X, the new mutant homeworld, where everything is great-presuming that you possess the mutant gene! 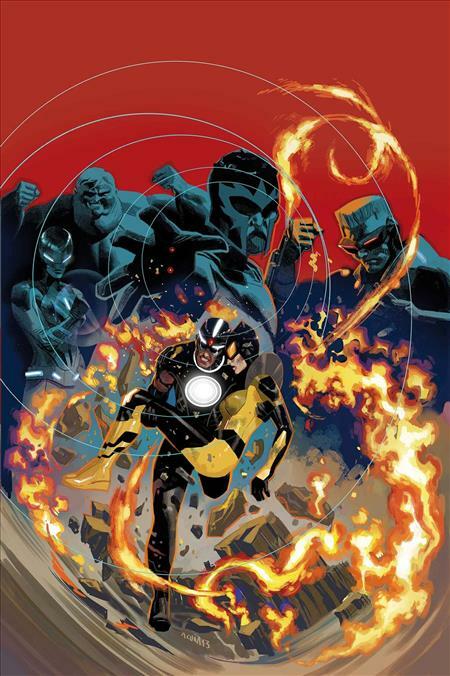 Janet Van Dyne, the Wasp, is the last human being alive, relentlessly pursued by Magneto and his All-New X-Force and their 'No More Humans' campaign, and protected by her husband, Havok! Witness the fate of the Uncanny Avengers--who survived the Apocalypse Twins' plot, and how? Yep, it does look good. I ordered this one. Its the only Marvel book I've decided to pick up on hardcover. I REALLY enjoy it~quite good! The only other book I'd go for in HC will be Aaron's Thor; and who knows when he'll show his colors and tank on the book? He's usually great for a year, then it all falls to utter crap. Well over a year so far and I'm still loving it. Your Millage May Vary. I also thought Scalped was great from beginning to end and it was over 50 issues. I didn't read Scalped; glad for that! My Aaron experience came down to Ghost Rider (got real bad at the end), Incredible Hulk (went HORRIBLY bad at the end), and Wolverine (which, admittedly, was pretty strong throughout, but flattened out at his end run). So, that's how my appraisal of Aaron was formed. While the League of Gods is a little silly in thought, I'm really enjoying it, and hope it always stays strong!!! I had a marathon read this week and I've caught up to issue 25. Pretty fun stuff by Remender. Reminds me of his Uncanny X-Force. Remender does a great job with large casts and he continues that trend here. Plus a lot of nice twists and turns. I like what he does with Havok and Wasp. Also does a great job with Scarlet Witch. Of course everything builds on top of each other to get us to Axis. I'll be picking this back up when issue 26 hits Marvel Unlimited. I'll go as far as giving it a 5 out of 5 Archangel babies. Remender is rather high on my list, these days.